Taken from Blue Sky Alpacas Pattern - Traveler's Series: "These deliciously soft mitts are great for winter and you'll want a pair in every color!" 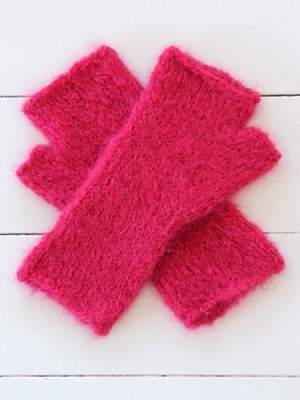 This pattern is from Blue Sky Alpacas Pattern - Traveler's Series - Brushed Suri Mitts. Size US 5 double point needles (or size needed to obtain gauge), stitch markers, and a tapestry needle are required but not included. Finished Measurements: One size after blocking. Gauge: 5 sts over 1". $16.80 -- Kit price including yarn only (no book or pattern).